The following post is both pretentiously pseudo-academic and about climbing. In short, it is unlikely to appeal to anyone. The weather in Squamish hasn’t been very inspiring lately. Consequently, the amount of time I’ve spent online reading about the latest controversies in the climbing world has been bordering on unhealthy. Climbing, it has been noted, is an arbitrary game where the participants make up the rules as they go along. It’s a lot like Calvinball (and not surprisingly, many climbers are about as emotionally mature as Calvin – myself included). The current controversies and debates are part of the ongoing historical dialogue wherein climbers articulate the ever-changing structure of rules that make it possible to talk meaningfully about climbing. What it actually means to “talk meaningfully” about something as silly as climbing is another question. I imagine that someone with post-structuralist leanings could find plenty to deconstruct within the “play” of the climbing game (PhD theses have been written about more ridiculous things). Some of the current topics of debate include whether it’s acceptable to place bolts on rappel in the mountains, how much evidence do climbers need to provide to support their claims, and what responsibilities do route developers have to future climbers. Of course, these ethical squabbles ignore more inconvenient moral questions such as whether your time and money is best spent climbing mountains instead of helping to feed impoverished children in the developing world (my roommate Seth’s opinion on this is here). 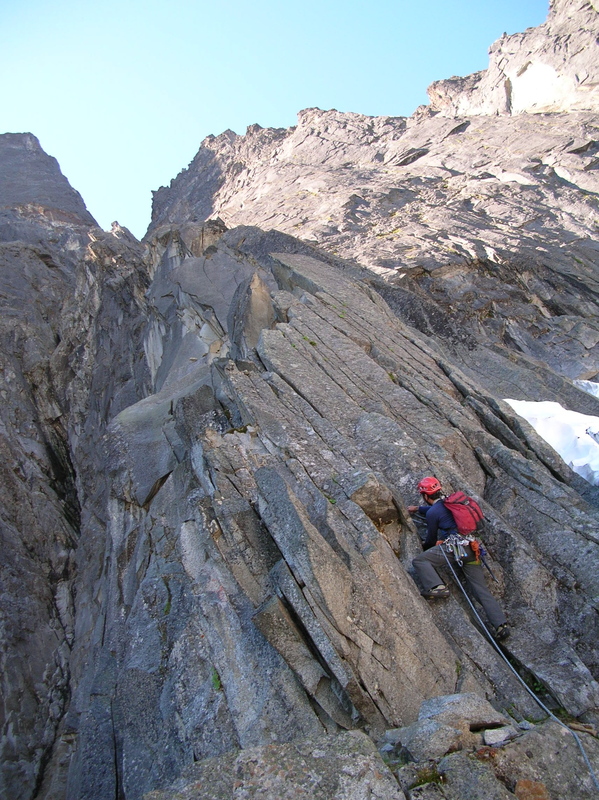 Colin Haley climbing on the North Rib of Mt. Slesse. He's been a diplomatic and articulate critic of rap-bolting on Cerro Torre. Rather than addressing one of the controversies du jour (if the weather doesn’t improve, I’ll be ranting about rap-bolting soon enough), I thought I’d broach the topic of climbing ethics by discussing an essay called “Hold Manufacturing: Why You May Be Wrong About What’s Right” by Bill Ramsey. I recently discovered the book Climbing: Philosophy for Everyone. It was in the “Philosophy” section at Chapters, nestled amidst books such as Twilight and Philosophy and Metallica and Philosophy. I’ll admit to enjoying the odd book of pop psychology, sociology or physics, but the abundance of books about the philosophy of vampires is something of a sad comment on the state of intellectual affairs in our culture, particularly given that I couldn’t find any books on the philosophy of Quine or Kripke. Curmudgeonly misgivings aside, I’ve been enjoying the essays in Climbing: Philosophy for Everyone. In fact, I’m somewhat astonished by the mere existence of so many contributors with solid credentials in both climbing and philosophy. In particular, Ramsey’s contribution regarding the ethics of chipping holds into otherwise unclimbable sections of rock struck me as a cute piece of reasoning that provides a good model for applying practical ethics to climbing related problems. Ramsey argues that the anti-chipping view is untenable and that most of the “overt furor and indignation” is the result of dogmatic bias. Although Ramsey is quite convincing in his support for limited chipping, I tend to think that there’s more to the formulation of the rules of climbing than he would have us believe. After giving a quick sketch of Ramsey’s argument, I’ll survey a few lines of reasoning that could provide plausible rebuttals. 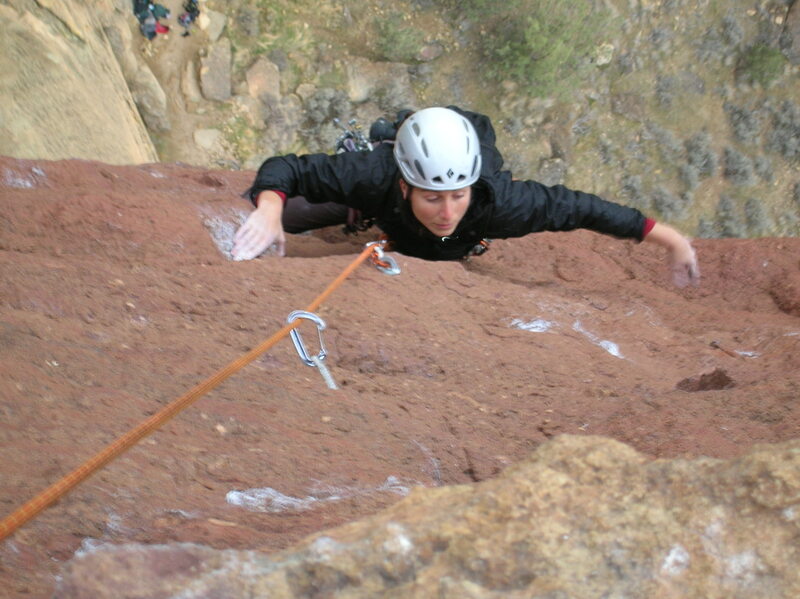 Karina Benavides climbing Monkey Space in Smith Rock, Oregon. Bill Ramsey along with Chris Jones made the first ascent of this route in 1979. True to the nature of this age of internet experts, the fact that I know next to nothing about moral philosophy is no obstacle to my pontificating about it at length. However, intelligent people have been thinking about these problems for the last few millennia and a remarkable literature on Ethics exists. Most of the half-remembered ideas that follow are borrowed without a shred of academic rigour from smarter people than myself. What is it that makes something right or wrong? Ramsey writes that “While climbers need to decide for themselves many of the rules they ought to abide by, it doesn’t follow that anything goes or that a simple majority opinion is decisive.” This is a sensible view, and it seems reasonable to extend it to claim that facts of matter must exist with respect to climbing ethics independently of what individual climbers or climbing communities happen to believe (in philosophy jargon, Ramsey is making a meta-ethical claim against subjectivism and social conventionalism which are both forms of moral relativism; some form of moral realism seems to me to be a natural alternative to these views). Moral relativism is an understandable post-colonial sentiment but it turns out to be incoherent. For example, that slavery was widely accepted in 18th century American society doesn’t mean that it was morally right. Likewise, if a community of climbers takes to bolting next to good cracks, that in itself is not sufficient to make it ethical, even on their own crags. A further problem arises when this community comes into conflict with a staunchly anti-bolting community. If we accept moral relativism then it seems impossible to adjudicate such a dispute. Consequently, it’s reasonable to conclude that there must be objective moral facts about climbing ethics. Admittedly, the nature of these seemingly semi-mystical moral truths and our relation to them are difficult questions. I certainly don’t have the answers, although I would suggest that moral truths are perhaps not so different from other abstract entities such as mathematical truths. A bizarre geological feature of Chamonix granite. The frontpoints of my crampons fit remarkably well into this pocket at the crux of the popular Arete des Cosmiques on the Aiguille du Midi. Ramsey’s pro-chipping argument is a perfect model for applying practical ethics to climbing. His first premise is that altering a cliff in order to make a climbing route possible is acceptable. This may sound contentious to a non-climber, but the truth is that most climbs require significant alterations to the rock. Even in Squamish where the granite is remarkably solid, first ascentionists often need to clean off loose blocks, crumbling flakes and a great deal of dirt and moss. In fact, failure to do so will generally result in complaints and the widespread avoidance of the route. 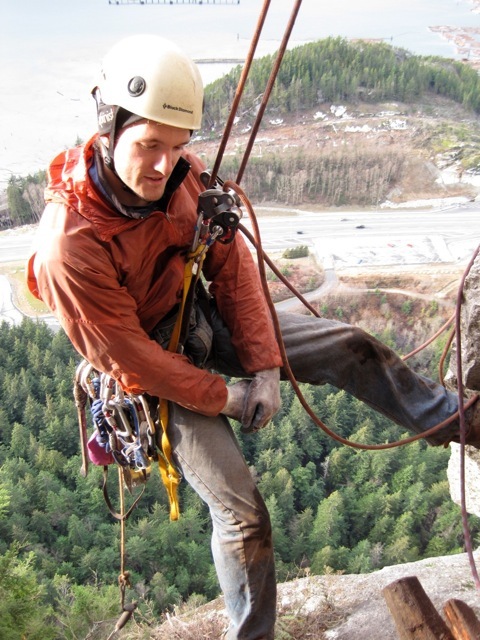 Given that the establishment of many of the best rock climbs in the world required cleaning loose rock or drilling bolts, rejecting Ramsey’s first premise would mean condemning much of what climbers have traditionally valued. 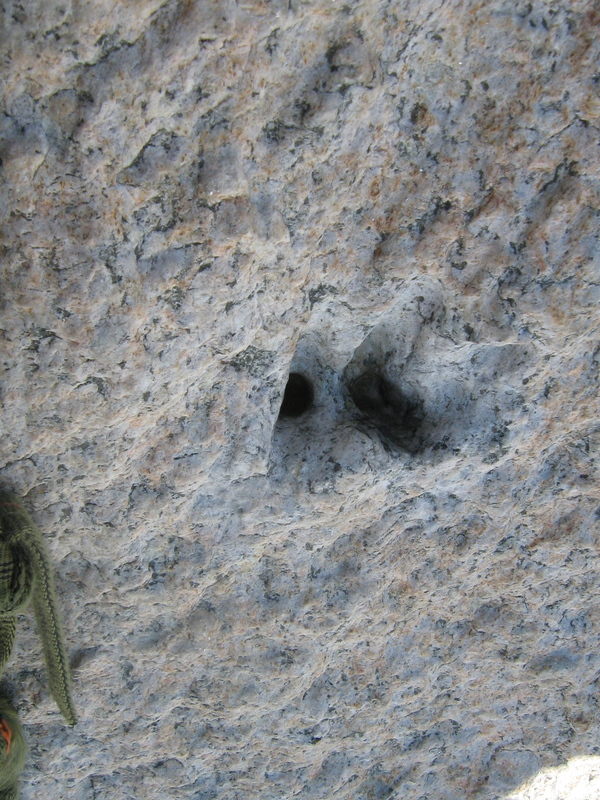 Ramsey’s second premise is that in certain situations, manufacturing holds to create a climbable route constitutes an acceptable alteration of the rock. The kind of situations that Ramsey has in mind are of the following type: “…the preparation of an unclimbed sport route in a sport climbing area that has mostly high-quality climbable sections but also segments of blank rock with no climbable features.” As Ramsey notes, this second premise is the one that most climbers “…explicitly and even vehemently reject.” He claims that the burden of proof is on the climber who accepts his first premise but rejects his second. If altering a cliff for the purpose of climbing is acceptable, what is it about chipping that makes it unacceptable? From here, Ramsay’s argument is negative: he states that there are four reasons for rejecting his second premise and he seeks to demonstrate that each of these reasons are untenable. The second reason for rejecting chipping that Ramsey considers is that it “violates important environmental commitments”. This is clearly not the case. Drilling a tiny hole in a cliff alters the environment about as much as throwing a pebble. Not to mention that climbers routinely remove moss, lichen and bushes from cliffs. Even the visual impact of a drilled pocket is negligible compared to the trails of chalked holds and bolts at many climbing areas. The third reason commonly put forward against chipping is that it robs future generations of strong climbers. Personally, I’m rather partial to this consideration and I suspect that there have been a few natural 5.15s and 5.16s chipped into 5.13s and 5.14s simply for the sake of a mention in Climbing Magazine and a few pairs of free shoes. Ramsey’s defense is that these aren’t the cases he’s talking about. He has stipulated that he’s only defending the chipping of otherwise unclimbable rock. This seems reasonable; I don’t climb 5.14 (Ramsey, however, climbed 5.14b at age 48!) but I’m pretty sure I know unclimbable rock when I see it. A second response that Ramsey makes is that chipping could potentially benefit future strong climbers. At any grade, there is always more unclimbable rock that could be chipped into a route of that grade then there are naturally occurring routes of the grade. What’s more, chipping doesn’t always make routes easier; there are numerous cases where routes have been chipped to make them harder (and thereby more newsworthy). 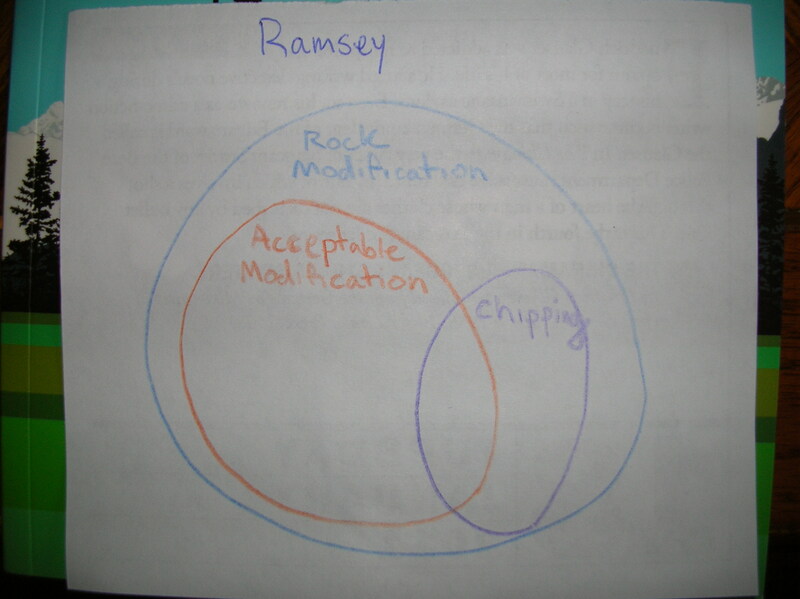 The last reason that Ramsey looks at is that if chipping is tolerated, it could lead to abuses. He claims that this is missing the point: “…most things done badly are bad. But that has nothing to do with the propriety of the practice done responsibly.” Although I tend to agree with Ramsey, I do think that he is too quick to dismiss this objection. Admittedly, we don’t decry all bolts simply because their use is occasionally abused. However, as a society, we’re generally content with laws that prohibit children from purchasing guns over the counter, in spite of the fact that we don’t tend to think guns themselves are bad if they’re used responsibly. Analogies to guns (drugs are another example) are poor however; the consequences of misusing a gun are rather more serious than anything associated with the manufacturing holds. I hope that I’ve given Ramsey’s defense of limited hold manufacturing a fair treatment. It’s certainly a sound and provocative piece of reasoning. Ramsey writes that “… despite the overt furor and indignation over manufacturing, we really aren’t very clear about what, exactly, is wrong with it.” I think he has convincingly defended this statement by showing how the most popular anti-chipping arguments are incoherent. However, I feel that he’s being slightly disingenuous by dismissing off hand the origins of this “furor and indignation”. Surely climbers deserve a little more credit than Ramsey is giving them. If we are to claim that our anti-chipping intuitions are based on more than mere bias we need to show where Ramsey’s argument goes astray. To this end, I’ll examine a few options which I hope will show that, at the very least, the problem is more nuanced than Ramsey makes it out to be. Ramsey claims that cleaning loose blocks from a route and chipping are both instances of rock modification. However, I think that climbers view the cleaning of loose or flaky rock not as modifying, but as exposing. Sorry, I'm not much of an artist. Do you think I have to much time on my hands? 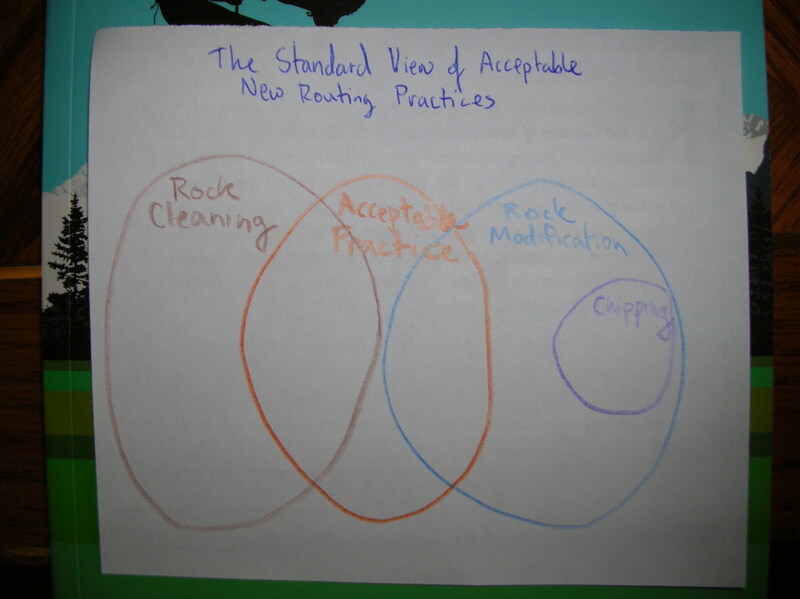 On the view represented by the second diagram, Ramsey’s argument fails because the instances he gives of acceptable rock modification no longer look like rock modification at all. The instance of rock modification that are considered acceptable might only be those that are done for the purposes of safety. I think this distinction between the concepts of cleaning and modifying helps to explain the difference in attitudes that climbers have towards trundling loose rock versus chipping holds. This is the type of semantic distinction that philosophers like to make, but they don’t mean much if they’re not a reflection of the way things are out in the real world. Is cleaning equivalent to exposing the true nature of the cliff while chipping is somehow defaming that same nature? I think this distinction will appear more plausible to climbers who haven’t been directly involved in creating a new route. The reality is actually rather messy. While I think that this distinction captures some of what motivates anti-chipping intuitions, in actual fact it’s arbitrary. New routing in Squamish is a dirty job. Helping Jer Frimer on his route the Milk Road. Photo: Jeremy Frimer. Another response to Ramsey is to claim that he has failed to consider an unanswerable reason against considering hold manufacturing to be an acceptable form of rock modification. But does such a reason exist? On the east side of the Cacodemon Boulder in Squamish there’s a completely blank wall with a line of pockets drilled into it. This route is outside the scope of Ramsey’s argument since it doesn’t link natural features; in fact I don’t think there’s a single natural hold on the route. In my opinion, this route should never have been established (although I still have a great deal of respect for the people responsible for it). In his conclusion, Ramsey admits that “… all else being equal, a purely natural climb is usually better and more appealing than one with manufactured holds.” Ramsey means “better” in a purely aesthetic sense, and I think this captures some of what I object to about the drilled pockets on the Cacodemon. It’s not that the route is such an eye-sore (well, the plastic gym holds are a bit ugly). It’s that, apart from being a game where the participants stipulate the rules, climbing is a creative pursuit with attending aesthetic considerations. Climber’s commonly make value judgments about the quality of routes. Ramsey admits that manufactured holds generally detract from the value of a climb, but he thinks they do so in a way that’s similar to poor bolting or wildly inconsistent difficulties. We generally wouldn’t consider a work of art to be so bad that it was wrong to create it unless it promotes hate or pedophilia. Can a climb be so unaesthetic that it should never have been created? This is a difficult question, but if anything qualifies, it would be the drilled pocket route on the Cacodemon. The vagueness of Ramsey’s definition of “limited” chipping admits to something of a Sorites Paradox; it seems like the line between reasonably chipped routes and routes like the one on Cacodemon would be a tough line to draw. Conversely, if Ramsey isn’t willing to defend fully chipped routes (as he seems to avoid doing), he ought to give an account of how chipped holds that link natural features are different from ones that don’t and how we are to decide how many natural features are required to make chipping acceptable. As I write this, the weather outside has improved. With the appearance of the sun, ideological squabbles appear somewhat trifling. Nonetheless, climbers take this stuff seriously. My primary intent in writing this rambling essay (aside from passing a rainy day) is to show how I think it’s feasible to examine climbing ethics at least semi-rationally. Whereas much of the “debate” surrounding the ever-rotating series of ethical controversies in climbing is little more than insults and dogma, I think it’s quite to possible to examine things both sensibly and politely. However, with any luck, the weather won’t give me occasion to try to do so again for at least a little while. You’re sure you’re not reconsidering an academic career? It’s mostly hanging around, learning the ropes and using big words – you’d be a natural! A friend just told me about your analysis and I finally got around to checking it out. It is AWESOME! Very flattering that someone would take the time to write such a careful and fair-minded assesment! You make a number of really good points, some that I need to think more about. Anyhow, I agree with the other commentator — you should consider post-graduate work and possibly an academic career in philosophy. I really appreciated your blog. Thanks for your kind words. It made my day to see that you’d taken the time to read my commentary. This is a very well written and thought provoking essay. I enjoyed reading it. Hey! This was excellent applied philosophy. Most of it is crap, so I always avoid it, but this was a genuine use of the machinations of philosophy for a practical but ill-defined problem. I just wanted to add I always felt like it was a violation of the game’s premise. Mountaineering, alpinism, sport, trad and bouldering always operated on the principle of finding a path through nature’s obstacle course. If you can’t find a path through it all, that is disappointing, but it makes the rare occasions that it all links up a special find. It was always a tango with a beast much stronger. If we let chipping into design nature is no longer the limitation. Now it just comes down to the moves you feel like doing. Why are we climbing then? If navigation of nature is not the premise of the sport, what is?